Welcome to the Advisory and Services Firm Social Business Adoption microsite. Published in January/February 2013, this research survey asserts that commercial, government and nonprofit organizations will increasingly need advice on how to use social business to achieve 21st century competitiveness if they are to survive the shift to the Knowledge Economy. Interacting and building relationships in the Social Channel is the key to thriving in the early 21st century. Enterprise organizations will require guidance in all phases of the Social Business Life Cycle; however, established advisory firms lack the skills to provide holistic guidance to organizations that need to transform. Advisory and Services Firm Social Business Adoption, by using a defined use case to put firms on a level playing field, evaluates their social business advisory and services capabilities that will be relevant to clients in 2013-2020. For the first time, quantitative metrics test and compare firms using benchmarks grounded in using social technologies to transform relationship, business and organization. Strategy firms—the most trusted firms for strategy and profound organization change have been making measured investments in social business thought leadership in recent years. Big Four firms—advisory businesses of global accountancies are moving aggressively yet cautiously into social business-as-transformation. Analysts—technology analyst firms research and report on social business technologies and offer strategy guidance. Enterprise I.T.—traditional and cloud providers of hardware, software and services for global and midmarket clients are increasingly talking about social business products and services. Marketing/Advertising/PR Agencies—have been far in front assisting global brands with social media, using a marketing approach. Pureplays—have been launched specifically to serve clients adopting social business. All advisory and services firm types have various competencies relevant to social business transformation, but how can they serve CEOs and CMOs in 2013? The primary goal is to assist CEOs and CMOs in navigating the cloud of advisory and services providers as they marshall their organizations to greater vitality using social technologies. Just as important, the study aims to be a resource to advisory and services firms as they consider how to position themselves based on their core competencies and the the market’s growing need for social business strategy and transformation expertise. Now available: “Executive Briefings” summarize (14-slides) results in two versions: Guidance for Clients and Guidance for Firms. 5 March—Executive Summary lists quantitative scores and rankings for all firm categories. 12 February—Pureplay Report includes: Dachis Group, SocialxDesign, SideraWorks and Strawberry Frog. 7 February—Enterprise I.T. Report includes: Accenture, BearingPoint, Capgemini, Cognizant, Dell, Hitachi Consulting, IBM, Infosys, Salesforce.com and TCS. 6 February—Big Four Report includes: Deloitte, Ernst & Young, KPMG and PwC. 5 February—Marketing/Advertising/PR Agency Report includes: Critical Mass, DDB, Digitas, DraftFCB, Edelman Digital, Leo Burnett, Ogilvy Social, Organic, Razorfish, R/GA and Saatchi. 30 January—Strategy Firm Report includes: AT Kearney, Bain, BCG, Booz & Co, LEK, McKinsey, OC&C, Roland Berger and Strategos. 29 January—Analyst Report includes: Altimeter Group, Constellation Research, Forrester, Gartner, IDC, NM Incite and Yankee Group. 28 January—Guess the Scores Contest enables you to win valuable research survey report prizes by answering 4 simple questions about Advisory and Services Firm Social Business Adoption. 27 January—Preview outlines research survey design, rationale and metrics. I invite your inquiry about detailed results. Subscribers also gain access to the full report automatically. 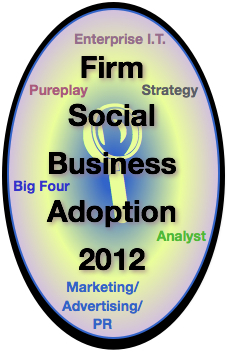 I received your message today on Advisory and Services Firm Social Business Adoption 2012. It hit my GMail spam folder.